Theater Company has proven itself to be the premiere theater company for Shakespearean productions. 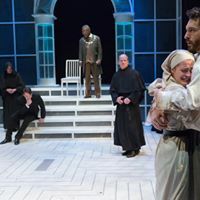 This year, when the company decided to tackle Measure for Measure, one of Shakespeare’s problem plays, it again proved to be no problem for director Charles McMahon nor veteran actors Anthony Lawton and Ben Dibble. The production might have been a taxing one as everyone in the eight member cast has multiple roles but the very talented ensemble cast pulls it off with ease. Anthony Lawton is in top form and Ben Dibble is at the top of his game. Chris Anthony, Adam Hammet, Kirk Wendell Brown and Jered McLenigan are marvelous additions to the ensemble cast as are Charlotte Northeast and Claire Inie-Richards who performs an amazing Isabella. Despite the problems that had to be overcome, this is a comedy and quick costume changes add to the humor. The second act is quite a bit funnier than the first. The conclusion is not obvious until the end of the play and even in the final seconds there is a humorous twist. Whether you are a Shakespeare fan or not, this is a production you won't want to miss. For tickets or more information, call 215-829-0395 or visit online at www.lanterntheater.org.